NBC has confirmed the revival of the Knight Rider program to TV in early 2008. The show will begin as a 2 hour movie airing on February 17th. Although it is exciting this show will be back on the air, the real story is the muscle car they have selected to profile. Show writers have decided on Ford Mustang GT500KR to take the role of KITT. The car is portrayed in three models: KITT Remote, KITT Hero, and KITT Attack. 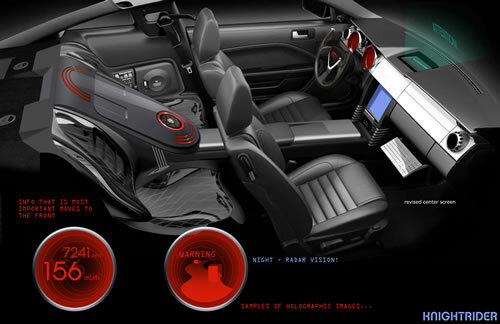 KITT Remote is a remotely controlled version which is supposed to be operative from one mile away. The KITT Hero cosely resembles a GT500 and includes a true 540hp motor for motivation. KITT Attack includes a variety of body kit enhancements, including spoilers and flairs literally protruding from every angle of the car. It makes for a busy looking body treatement, but hey, this is KITT baby! Casting for the show includes Justin Bruening, Deanna Russo, Sydney Tamiia Poitier, Bruce Davison, and David Hasselhoff. The voice of KITT will be supplied by Will Arnett from Arrested Development. BURBANK, Calif. - December 12, 2007 - As "Knight Rider" -- NBC's iconic 1980s television classic that became a runaway success, comes roaring back to life on the network with an updated sequel that will air as a two-hour movie event on Sunday, February 17 (9-11 p.m. ET) -- NBC unveiled the new customized KITT Ford Mustang to be featured in the series in a press event held at NBC's Burbank Studios today. Dave Bartis ("Heist," "The O.C.") and Doug Liman ("Mr. and Mrs. Smith," "The Bourne Identity") serve as executive producers. NBC also has an arrangement with Ford Motor Company that provides for a unique content opportunity that makes the Ford Mustang one of the stars of the movie. The three cars to be employed in the series include the KITT Hero -- a Ford Mustang Shelby GT500KR that is playing the part of the everyday Hero car with 540 horsepower; the KITT Attack -- a super high-speed version of the Ford Mustang Shelby GT500KR Hero car that transforms into Attack mode with the help of air-ride technology and specialized body parts -- and a KITT Remote, which is a driverless Ford Mustang Shelby GT500KR version of the Hero vehicle. 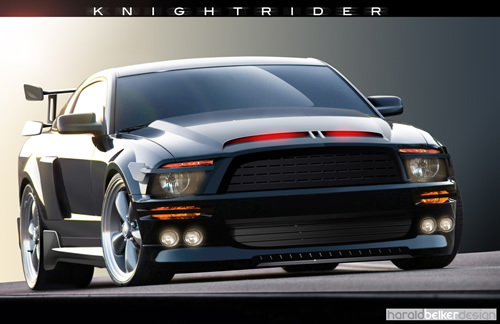 As the original story resumes, the new KITT (Knight Industries Three Thousand) is absolutely the coolest car ever created: its supercomputer capable of hacking almost any system; its weapons systems efficient; and its body -- thanks to its creator's work and nanotechnology -- is capable of actually shifting shape and color. Plus, its artificial intelligence makes it the ideal crime-fighting partner: logical, precise and possessing infinite knowledge. It is the ultimate car -- and someone will be willing to do anything to obtain it. Sarah Graiman is a 24-year old Ph.D candidate at Stanford University, following in her genius father Charles' (Davison) footsteps. But when men attempt to abduct her, Sarah receives a mysterious call from KITT warning her that he's a creation of Charles, who also invented the first KITT 25 years ago -- and that her father is in serious danger. Sarah and KITT track down her best friend from childhood, Mike Tracer (Bruening), a 23-year-old ex-Army Ranger, whom Sarah hasn't seen since he left home at 18. Having served in Iraq, Mike is now jaded and lost and initially resistant. Eventually he agrees to help Sarah and the two set out to discover who's behind the attempt to procure KITT and find Charles. Along the way, Carrie Rivai (Poitier) plays the agile yet tough FBI agent who has a long-standing friendship with Charles and Sarah. Due to those ties, she is brought into the mix to help in the search. David Andron is supervising producer and writer. Steve Shill ("Dexter," "The Tudors"), also a co-executive producer, directs the two-hour movie from Universal Media Studios and Dutch Oven Productions.